Embrace the ‘face of evil’ – that’s the message from A Rocha UK, as they launch a new resource about bats. Bats have been linked with evil since earliest times. But A Rocha UK’s unique online publication hits back at Hallowe’en superstition by putting the unpopular creatures in a more positive light. Produced with input from the Bat Conservation Trust, the resource has already attracted support from church leaders. "Churches don’t need to feel stumped about how to live and let live with bats," said Bishop of Willesden and Deputy Bishop of London Rt Rev Pete Broadbent. "A Rocha UK’s leaflet bowls over the arguments against bat conservation, bails you out with advice on how to be a bat-friendly church, and offers practical suggestions on alternatives to bats in the belfry." West Sussex vicar Rev Richard Hayes also backed the resource. "As the Rector of three early medieval rural churches, I’m very aware of the potential 'problems' that bats in the belfry – or anywhere else in church – can appear to create," he said. "Renovation work in one of our churches had to be timed carefully to avoid disturbing the bat population. This publication offers helpful and balanced advice in living wing by jowl with those who also find sanctuary in our holy places." 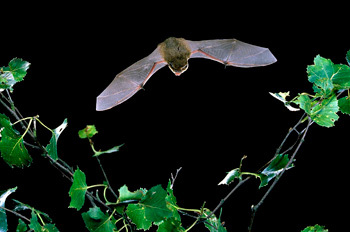 Bats are part of creation, described in the book of Genesis as "very good", said A Rocha UK Conservation Director Andy Lester. "Church buildings have become extremely important as roosting and hibernation sites for bats," he added. "While Hallowe’en celebrates the darkness of fear, we celebrate the light of God’s creation," said Andy Lester. "Bats may have been regarded with doom, but we regard them with delight, because God has made them. Traditionally, All Hallows’ Eve used to be a Christian celebration, anyway." The publication encourages churches to change their attitude towards bats, and to join A Rocha UK in protecting them. The resource is available as a free download. "We’re encouraging supporters to print out the leaflet and give it to the relevant person at their church," said Andy. "Pass it on to your leader or PCC – or whoever’s responsible for church gardens and buildings."